During the actual game play, with a bit of cash in your pocket and a few willing emigrants on board, you beach your ship on a deserted island. Then, you quickly set up a small headquarters on the beach and embark on your conquest of the island. At first, food is provided by a fisher and hunter, for whom you need to set up accommodation in an appropriate place. The wood needed for more buildings is provided by a lumberjack. Paths help transport goods quickly to and from your headquarters. Settlers at first live in simple tents and buy their food at the marketplace (Figure 1). Figure 1: Tents for hunters and lumberjacks nestle in the forest, the fishermen set up on the water, and settlers cluster around a marketplace. Each building requires very specific environmental conditions: Whereas fishermen want to live near the water's edge close to the fish, the lumberjack needs to work in the densest forest you can find. Although you can plant trees, this will cost more money than felling the trees of the natural forests. 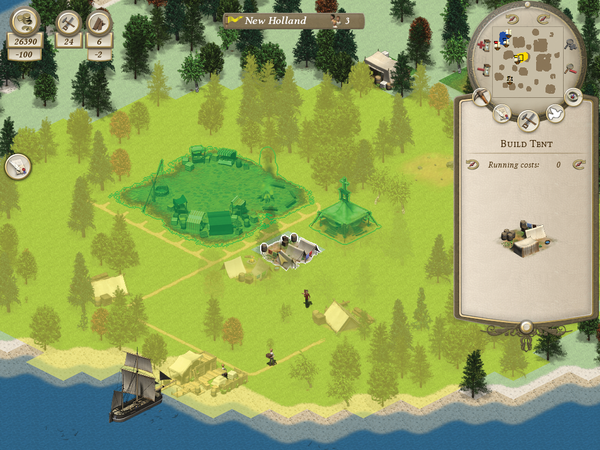 As prosperity increases, so do the needs of the settlers. At first, they only ask for food and a church; later, they want beer and cigars. All of these requirements must be met before the inhabitants move up in the social hierarchy, which at the same time unlocks other types of buildings (Figure 2). In most cases, you can't build these new structures from wood, which means setting up factories; for example, bricks are produced at the brickworks, which in turn need clay from a special pit. Figure 2: As prosperity increases, the settlers independently extend their homes. At each stage, new companies, crops, and services become available. If the island lacks some raw materials, you can buy them from traders for cash. Some enterprises don't just empty your cash register during the building phase, but also during operation; for example, the priest at the church asks for a steady wage (Figure 3). You can earn the money for all these expenses through taxes or by exporting the goods produced on the island. Figure 3: Each building has its own intake area. Only the settlers residing in the green zone can reach this pavilion for prayer. Another church is required for settlers outside this zone. 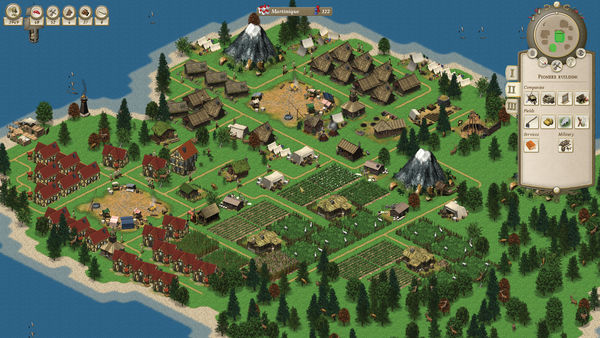 As you slowly build a functional economic system, further settlements grow around your village. You can trade peacefully with the local inhabitants, forge alliances, or attack their villages and assimilate them into your community. However, before doing so, you will want to take the precaution of protecting your own production facilities with guard towers (Figure 4). Figure 4: Manufacturing, import/export, and security are hallmarks of a successful economy. Unknown Horizons is still under development, so you will come across display errors or unfinished graphics now and then. Although the developers have announced an exciting single-player campaign, it still doesn't exist. 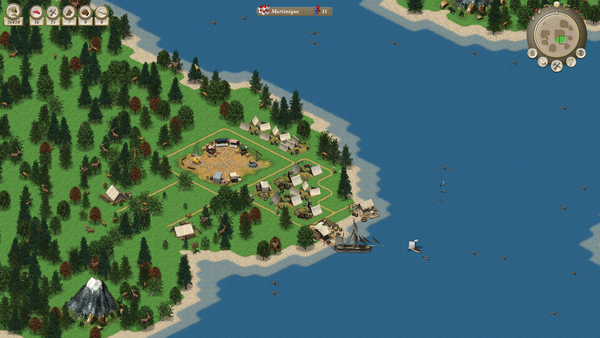 Currently, you can only generate a map and then set off to develop the island – either alone against the computer or on a network against other players. 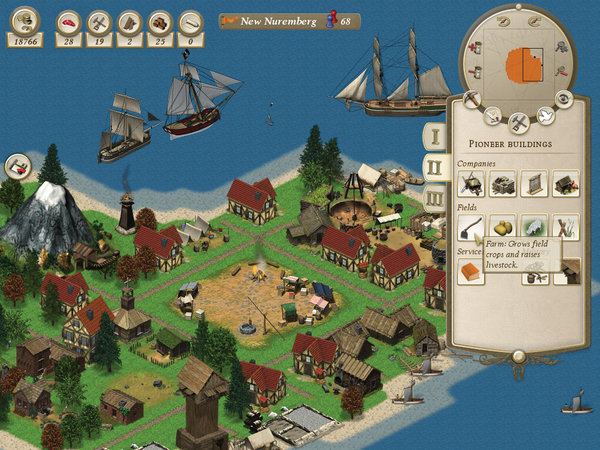 Settlers quickly reach level four, forcing you to set up all the buildings at quite an early stage. As the game progresses, you can't get an overview of the needs of the individual inhabitants – for now, you have to click your way painstakingly from house to house. So, much fine-tuning is still needed. The development history has been turbulent because of lack of free time and frequent changes in developers and project managers – as is typical of many free game projects on this order of magnitude,. Unknown Horizon shows that good English language documentation is the prerequisite for attracting many supporters on the Internet and for taking part in the Google Summer of Code. That said, the current developers are on the right track. As long as they don't give up again, Unknown Horizons could soon become a worthy competitor – at least for "Anno 1602."